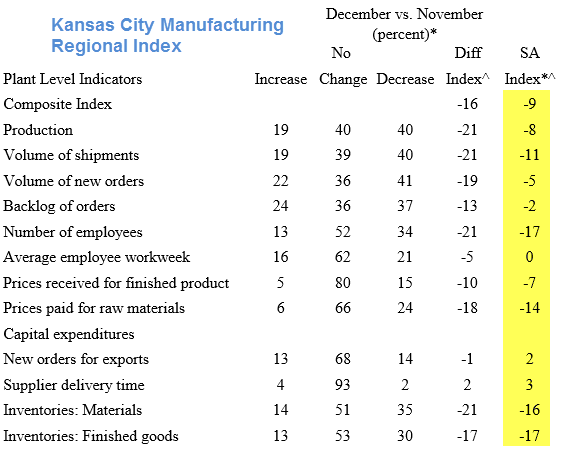 The Kansas City manufacturing index is back in contraction as expected in this corner after a brief wonderland experience last month that took the diffusion index to +1. Economists don't guess about this region, so let's dive into the details straight from the 10th District Fed Report. 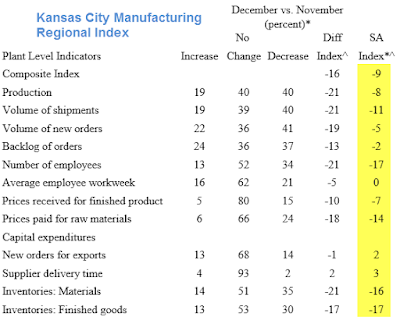 The first three columns show the Fed surveys about 100 manufacturing companies. The diffusion index is formed by subtracting the number of companies with a decrease from the number of companies with an increase. The last column is a seasonal adjustment. The bad news in manufacturing goes on, and on, and on. This is the eighth contraction in nine months.